Some of us like to read books while others prefer to watch the television. Now if you are looking introduce your kids to classics or other literature, even when they are not really interested in reading, you can use the Apex Text to Speech 2.3.8.2 application. The application can be used to read out any textual matter be it be a novel available in PDF file or a lengthy webpage. The remarkable quality audio file generated by the tool can be heard with the help of any MP3 player and the tool is rather easy to use. When you start the Apex Text to Speech 2.3.8.2 tool you are showcased with a very basic interface. Incidentally the whole idea behind this tool is to make it easy to use for anyone. You just need to copy paste the text you wish to read out and the software will do the rest. It also allows you to save the output in form of a .wav file. You can control the speed with this the text is read out using the drag bar at the bottom right pane.. Further the tool offers you the choice of the voice in which you wish to hear out the text and same can be opted from drop down list available in the bottom left pane under the Voice label. Incidentally both male and female voice options are available. A whole set of other controls including Pause are present in the tool and you can also click on the Help option for any assistance that you may need. Text to speech converter software convert notepad, readable PDF eBook, clipboard text content into the human voice in normal verbal speaks. This program can change any text content such as MS Word, Webpage, PDF files, RSS feed, RTF, stories, news, articles and emails into usual spoken audio. 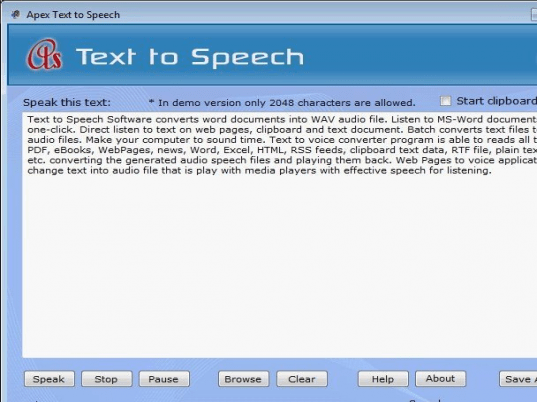 Text to speech conversion tool is changing any written text to popular WAVE audio format with best quality. You can hear this converted audio clip with the help of any MP3 players in anywhere any time. Text to speak application reads clipboard text content in natural sounding voices. Word to audio utility can read your clipboard text data from any file and change it into WAV format for listening anytime and anywhere. Comprehensible human sounding voices just click save as button to create a WAVE file for hearing. This application provides best GUI workâ€™s simple easy and fast. You can make your audio file from your notes eBooks paper and other text document with this simple program and no need to any other supporting application. * This tool provides best GUI. * Program supports all text formats. * Text to speak converter application converting your text content into spoken sound file. * Word to voice conversion program has very simple, easy to use and user friendly interface. * Email to speech program speaks your text document and HTML files clearly and loudly. * Save voice as compressed WAV files. * Compatible with Windows 2000, 2003, XP, Vista and Windows7 both x32 and x64 bit OS. Converts PDF files into DOC and DOCX documents. Creates full EXE files from the BAT format.